I'm very pleased to announce an upcoming talk by former Pixar colleague and friend Sharon Calahan. I was a student of Sharon's during the production of A Bug's Life, and I have used her teaching materials in my own classes, such as the chapter called "Storytelling Through Lighting" from the Advanced RenderMan textbook. That chapter appears oddly-situated, a visual and non-technical treatise hidden deep in a book rich with SL programming tips and renderer architecture insights. This talk is similar in its contextual placement: although sponsored by the School of Cognitive Science at Hampshire (and by me, arguably a computer animation professor), it will be very much a talk about live action film visuals. There are no Pixar productions on the long list of films she is drawing from, and I don't think she'll say a word about render times, shadow maps, or RenderMan bugs. Please don't be distracted by this disciplinary cross-pollination. The tools of computer animation are just another set of tools for making films, after all, so it is logical for someone working as a Director of Photography anywhere to draw from the larger history of cinema. If you've been in any of my classes, you know that computer animators (in the broadest sense) are simultaneously--by necessity--students of image making and computation. I am pleased, proud, and lucky that Hampshire has continued to see value in a program that mixes these disciplines regularly, and I am excited that Sharon is coming to share her insights with all of us. 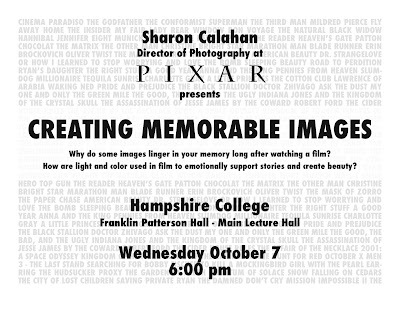 Sharon Calahan, Director of Photography at Pixar Animation Studios, will be speaking at Hampshire College on Wednesday, October 7th at 6pm. Why do certain images linger in our memories long after watching a film? Calahan will explore this question using a collection of favorite film images from over 70 years of filmmaking and over 80 films. She will share how she thinks about light and color in the creation of beautiful images that emotionally support the story of a film. ABOUT THE SPEAKER: Sharon Calahan joined Pixar Animation Studios in 1994 as lighting supervisor on the studio’s first feature film, Toy Story. She then served as director of photography on A Bug's Life, Toy Story 2 and Finding Nemo. She was the director of photography on Disney/Pixar’s Ratatouille, which won an Academy® Award for Best Animated Feature Film. Calahan is currently working on Cars 2. Calahan knew at the age of three that she wanted to be an artist for Disney. She went on to study graphic design, illustration and photography. Following art school, she began her career as an art director for broadcast television and video production. Prior to joining Pixar, she was a lighting director at Pacific Data Images completing commercial work, longer format television, and graphics packages. Calahan has given numerous presentations and taught many classes in character lighting, shot lighting, master lighting, and, more generally, painting with light and overall composition, both at Pixar as well as outside of the studio. Reminder: the Bit Films Fall Internship application deadline is next Monday, September 14th, at 5pm Eastern time! The application information can be found here. Unlike most fests, Moondance (Boulder) has our film programmed with a feature instead of with a bunch of shorts. The feature (Living Death Valley) looks like a captivating 40 minute journey through Death Valley, California which I think will make for a great pairing with our short. Also, a lovely little review came from the folks at the Animation Show. It would be fun to be a part of their traveling program. I wanted to announce as widely as possible a number of exciting opportunities for Pioneer Valley animators and animation students this fall. There are an unusually large number of unique offerings for advanced-level students this term, a change that I'm quite pleased about. One quick note: if you want to be kept aware of the most current animation-related information at Hampshire and beyond, please sign yourself up for the animation mailing list that I maintain (go to http://lists.hampshire.edu). 1) Computer Animation I (Hampshire CS 174), Chris Bishop. TTH 2:00-3:20pm. 1) Animation Workshop (Hampshire CS 203), Chris Perry. Weds 9-11:50am. This class is tailored to 2nd and 3rd year students with animation experience who want to produce their own short animation projects over the course of one term. Think of it as a mini Div-III/BFA experience that will help prepare you for that eventual hurdle. 2) Bit Films Internships (at Hampshire's Computer Graphics Incubator Space). Days and times TBD. Talented students looking to work on ongoing high-end collaborative animation projects should apply. The official internship posting is up at http://www.bitfilms.com. Application deadline September 14th! 3) TA positions. Chris Bishop, teaching CS 174 at Hampshire, is seeking qualified TAs for Computer Animation I. As you might expect, there will be competition for many of these positions. Please be sure to contact the individual instructor of a class to find out how he or she handles enrollment, etc. Feel free to email me with questions, and thanks in advance for sharing this information with your students/friends! We have two screenings at Woodstock next month, one late on Friday night and one on Saturday afternoon. The Tower 37 calendar has been updated and you can see the Woodstock schedule for details. I'm pleased to report that the line up for the animation show includes no films we've screened with before (though some that will be in the Martha's Vineyard program next weekend). I'm also happy with the mix of animation types based on the little thumbnails for each movie. Some quick scanning of the festival program includes Mighty Uke, a documentary about the Ukulele which I really want to check out. More Than a Game, about LeBron James and his high school team. And Jonathan Demme's Neil Young Trunk Show looks exciting too. And that's just a sampling from the documentary section. I think we'll have a very full weekend. The awards ceremony is scheduled for 9pm on Saturday night ($75). And the Bit Films party? Not telling.